The 14-month old Solaire Resort and Casino, part of the Bloomberry Resorts Group, is already showing massive growth in an ever expanding Philippines gaming market. Bloomberry President, Thomas Arasi, said in an interview that their international business had increased substantially combined with the strong improvements in operating margins. The Solaire is the first of four resorts to open in the 120-hectare Entertainment City complex in the Philippines. The aim of the project is to compete with Macau for a share of the Asian gambling market. 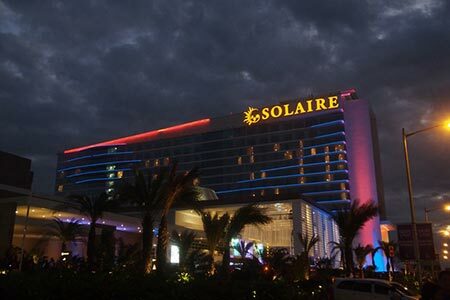 Solaire boasts 1,400 slots and 295 tables which generated around $162 million in gross gaming revenue in the first quarter of 2014. Billionaire Enrique Razon, the owner of Bloomberry, has taken active steps to signup 47 junket operators who help drive VIP’s and high rollers which has resulted in the casino reaching capacity. A project to add an additional 6,000 square meters of VIP gaming area is set to be completed before year end. City of Dreams Manila, a venture of Melco Crown Entertainment Ltd. and Philippine billionaire Henry Sy, is set to open by the end of this year and will be the second resort to open in Entertainment City. The new casino will bring competition for Solaire but Thomas Arasi feels it will also expand the market and attract more players. Are Pachinko Taxes On The Way?